Travel Insurance – Should You Buy It? Should you purchase travel insurance to protect the money you have spent on a luxury yacht charter? The answer seems to vary, depending upon who you ask. Many travel agents and consumer advocates advise travelers to buy it, while many others say to skip it. Adding to the dilemma is the difficulty for consumers to understand the components of the insurance. Typically, there are three components of most travel protection plans – trip cancellation/interruption, personal effects coverage, and emergency medical insurance. Let’s review each of these. 1. Cancellation Insurance – Coverage can cost anywhere from 5 to 8% of the total cost of travel. For example, travel insurance for a $10,000 Virgin Islands yacht charter vacation would cost between $500 and $800. Before purchasing this insurance, consider the fact you might already be covered under insurance you already have. If you paid for your trip with a credit card, look into the trip cancellation benefits provided by your credit card company. Many card companies include some coverage. 2. Personal Effects – The protection for personal effects offered in travel insurance plans may also be redundant. Your homeowner’s plan may cover the loss of personal effects when traveling. (REMEMBER – you are probably responsible to pay any loss amount up to the deductible). 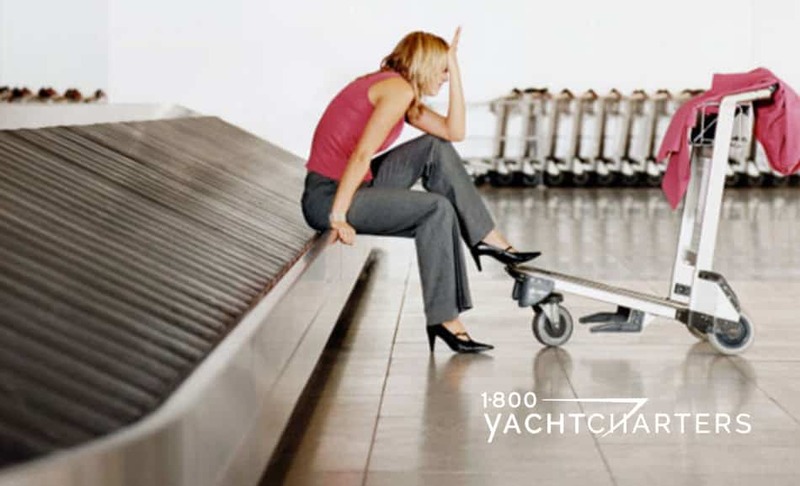 What about lost luggage? Again, you may already be covered, as most airlines reimburse up to $3,300 for lost bags on domestic travel and $1500 for international travel. If your purchased your flights with a credit card, some credit cards provide lost baggage coverage as well as protection for car rental losses. 3. Emergency Medical – This gets tricky. It is advisable to consider additional travel medical insurance to cover medical emergencies, particularly IF you plan to participate in higher risk activities such as water skiing, scuba diving, and riding personal watercraft, such as waverunners, when traveling abroad. Let’s say you are on a crewed catamaran charter in the Caribbean. If you need emergency medivac and treatment, these costs may not be covered by your existing medical insurance. For more information, visit the website InsureMyTrip. They represent over 20 insurers with various plans and prices. So what’s the bottom line? The financial loss incurred by a cancelled charter is a risk many people can accept, so trip cancellation insurance probably IS NOT necessary; however, the consideration of medical coverage requires more thought and research. Major items not covered in your family’s medical plan may necessitate the purchase of travel medical insurance.